Big corporations are a joke to many. They might mean well but their inner workings and people who run them are destined to be lampooned. 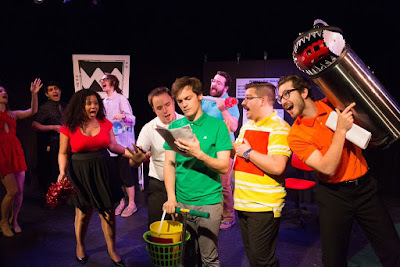 Written by Katherine Brann Fredricks and Paul Edward Nelson, Black Hold Wedding is a zany musical comedy about the sinister head honcho of an oil company and the resilient brainiac destined to bring him down. With shades of Urinetown, Black Hole Wedding is a weaker attempt at satirizing corporate America. With a score reminiscent of standard Broadway pop, Black Hole Wedding evokes a colorful vibe. The music has its catchy moments but gets completely bogged down by the libretto. It's evident that the story makes sense to writer-director Fredericks but she was unable to offer the complete saga without backtracking. Many integral plot points are skipped over at the start, causing severe problems along the way. With great potential in concept, Black Hole Wedding is in desperate need of a new directorial eye and an incredible dramaturg. And possibly a title change. It's not until nearly two-thirds of the way into the musical that any mention of a wedding is introduced. With the exception of the well-rounded Raymond, the remainder of the characters have potential for depth-filled arcs but fall victim to plot. Many crucial check points are rushed or bypassed, especially in Dean. Fredricks gives Dean a sick obsession with golf and rarely strays from the corny analogies. The rivalry between Dean and Raymond is not as strong as it needs to be because their interactions are minimal. If Dean was truly a tyrant with successful scare tactics, face to face threats bring higher stakes than passing off the work to his cronies. Like many other musical comedies, a love story was introduced. It was obvious it would occur but again, its introduction was rushed and unnatural. With so many unclear points within the plot, it’s hard to find what really works. To bring the piece to life, Fredricks brought a talented cast together to tackle the weak material. With the character so strong already, Aaron Riesebeck was a standout. Riesebeck brought a fun nerdy quality to Raymond that exposed Riesbeck’s ability to the leading man. As a Mr. Dean, Ravi Roth did what he could with the material offering a powerhouse vocal to the stage. Hadley Cronk as company masseur Summer was sweet and endearing. Ashanti J’Aria and David Marmanillo as company cronies Calista and Eugene had the most difficult characters to tackle, stuck in the rut of one-dimensional moments. With Katherine Brann Fredricks wearing the directorial hat as well, the production wasn’t quite up to the standard it needed to be. There were many moments of confusion that interrupted to flow of the show. With the makeshift as makeshift can be set by Shana McKey Burns, Fredricks ability for smooth transitions was hopeless. That being said, had the set continued with the black and white comic book style of Raymond’ apartment, it’s possible that things could have felt cohesive. The costumes by Anna-Alisa Belous seemed to have been sponsored by Aeropostale with every Dean crony sporting a color polo from the teen-loving shop. With the hopes of a flashy musical, Black Hole Wedding featured many moments of choreography. The stage at the Paradise Factory was small to begin with, feeling stuffed when the entire ensemble was on stage. But the choreography offered was more awkward than comical. The moment that the Macarena was brought onto the stage, all credibility was lost. Black Hole Wedding is rich in potential but needs a strong vision for a future. But thankfully with a strong and willing cast, the potential can be seen.